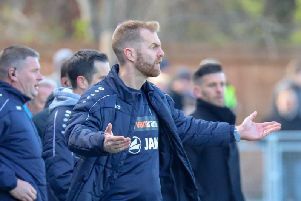 Harrogate Town manager Simon Weaver has finally been able to wrap up a deal for the defensive option he has been chasing for some time. Left-back Jack Senior joins the Wetherby Road outfit on loan from League One title-chasers Luton Town. The 22-year-old former Huddersfield Town man arrived at the CNG Stadium on Thursday and will remain at the club until the end of the season. "I'm really pleased to have Jack on board," said Weaver, who has been trying to bring in a left-footed defender for a number of weeks. "It's a deal we nearly managed to get over the line earlier in the season, but then Luton decided that they needed to keep hold of Jack for the time being. "He was at Huddersfield Town when he was younger so has good pedigree. He's a highly-rated player and there was interest from other clubs, so it's great for us that he's opted to come here. "This is a lad who needs to get more games under his belt so he can show what he's got and prove himself and I'm sure he'll fit in very well here." For Town supporters wondering what they can expect from the club's newest recruit, think Ryan Fallowfield, but with a left foot. "Jack is a very similar type of player to Ryan. He has the same qualities, but obviously operates down the opposite side of the pitch," Weaver added. "He's got a great engine and likes to bomb on. He'll provide us with width and good deliveries into the box. "He's got that competitive edge about him as well and a fiery side. "It'll be nice to have the option of a natural left-footed full-back in the squad."